A delegation of the country’s leading digital artists and producers are heading over to Austin, Texas this week to attend this year’s SXSW Interactive festival, funded by Arts Council England. The Festival celebrates the creativity and passion behind the coolest new media technologies. In addition to panel sessions that cover everything from web design to bootstrapping to social networks, attendees can make new business connections at the three-day Trade Show & Exhibition. The delegation, known as The Umbrella Group, will research new opportunities, view work, spot emerging digital trends and experience first hand one of the biggest international conferences and festivals of the year. Managed by iShed, The Umbrella Group comprises of Dan Efergan of Aardman, Sarah Ellis of Apples and Snakes, Simon Evans of Simon Games, Alex Fleetwood of Hide & Seek, Steve Manthorp of Manthorp ACT, Lisa Meyer and Jenny Moore of Capsule, Simon Poulter of Viral, Duncan Speakman, Nina Steiger of Soho Theatre, Jess Tyrell of Germination and Andrew Wilson of Blink. They will be joined by Clare Reddington of iShed and David Drake, Sally Luton and Adrian Friedli of Arts Council England. 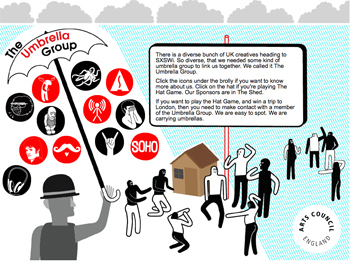 Whilst out at the Festival The Umbrella Group, who are easily spotted as they carry umbrellas, will be running The Hat Game designed by Simon Games. Featuring a gps tracked bowler hat, festival attendees will be able to make contact with The Umbrella Group, track the hat online and claim the hat, wearing it for as long as they can until it is claimed by someone else. or by searching twitter for #uksxsw.